Spermagonia on the upper surface of a new fruiting lateral leaf. 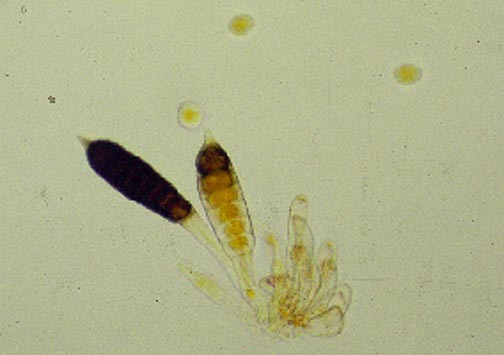 Teliospores (developed and developing) with paraphyses. Also shown are three urediniospores. 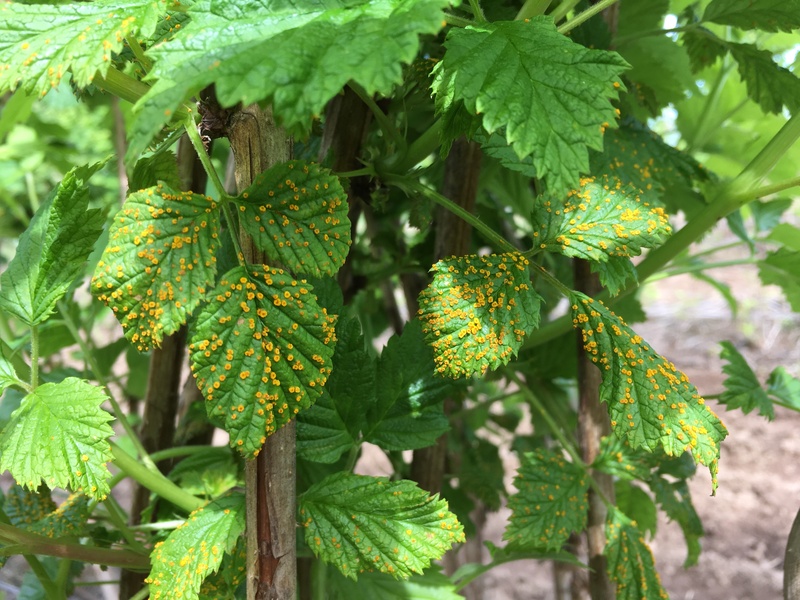 Yellow rust on floricane fruiting raspberry in spring. 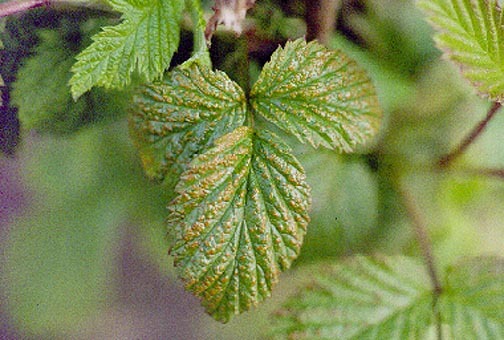 Cause Phragmidium rubi-idaei, a fungus widespread in red raspberry in western Oregon and Washington, particularly in years when spring rains continue late. Historically, rust has not been a problem in the 'Canby', 'Chilcotin' 'Newburgh', 'Puyallup', or 'Sumner' cultivars. However, new races are in the Pacific Northwest that will infect cultivars previously resistant, such as Meeker and Willamette. The fungus overwinters as teliospores on leaves. When infected leaves are trapped between canes, when they are tied to the top trellis wire, the fungus starts the disease the following spring at the top of the plant. 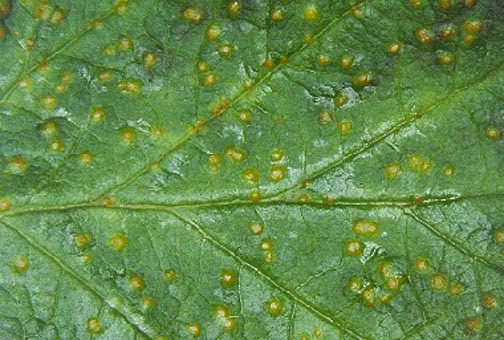 Symptoms Leaf infections in spring and early summer create a yellowish spotting on the upper leaf surface. At first the spots are very small, yellow to orange and slightly raised (spermagonia) but then new, yellow to orangish spore bearing structures (aecia) are produced in a ring around these spots. By summer, another yellow spore stage (uredinia) appears on the lower leaf surface. Some of these structures could be described as "orangish," without a good comparison. Fruit often dies on the canes before maturing if leaves on fruiting laterals are attacked early in the summer. 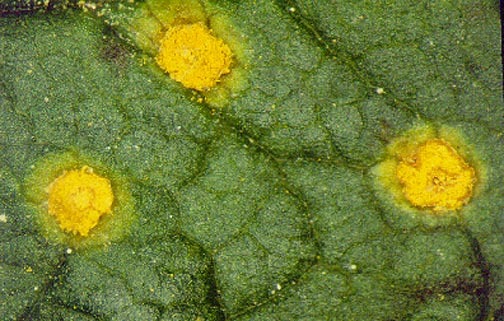 By harvest, black overwintering spores (teliospores) appear in the yellow uredinia on the lower leaf surface. Defoliation of severely infected leaves is common. All succulent plant parts are subject to infection, but cane lesions rarely are observed. Infected canes often are brittle and may break off when old fruiting canes are pruned out. Burying fallen leaves, old cane stubs, and refuse before new leaves appear will help eliminate inoculum sources. Postpone trellising primocanes until leaves drop off. Primocane suppression eliminates susceptible tissues when rust spores are present on fruiting cane leaves. Control cane vigor to improve air circulation in the plant canopy, which hastens drying of leaves and canes. Delayed dormant application. Wait until the first buds produce about 0.75 inch of new growth. When new growth is 3 to 4 inches and again when the first flowers are just about to open. Rally 40 WSP at 1.25 to 3 oz/A. Applications may be made up to the day of harvest. Group 3 fungicide. 24-hr reentry. References Anthony, V.M., Shattock, R.C., and Williamson, B. 1985. Life-history of Phragmidium rubi-ideai on red raspberry in the United Kingdom. Plant Pathology. 34:510-520. Bristow, P. R., and Derie, M. 1995. Reaction of red raspberry genotypes to isolates of yellow rustfungus by leaf disk assay. B & C Tests, APS Press 10:57.